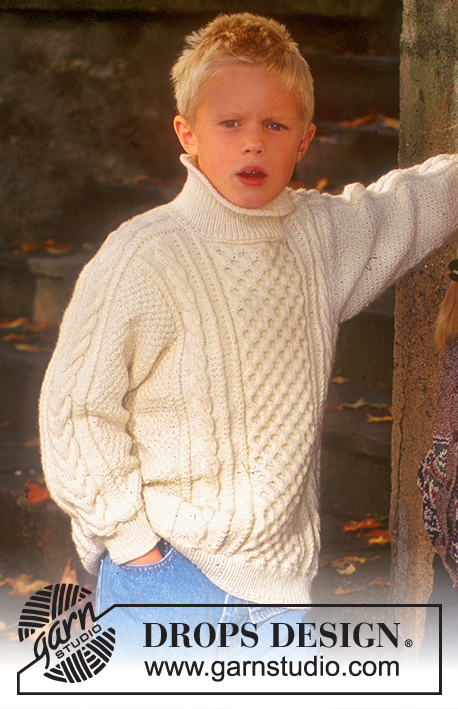 Go to original pattern for design DROPS Children 7-6. DROPS 2.5 mm [US 1] and 3.5 mm [US 4] circular and double pointed needles, or sizes needed to obtain correct gauge. 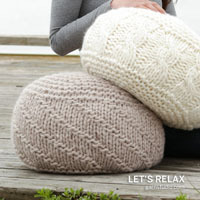 You can get the yarn to make this pattern from	25.60$. Read more. Pattern: See charts. One chart equals one repeat of the pattern. The pattern is seen from the right side. Garter st, when knitting in the round: *Rnd 1, knit. Rnd 2, purl. * Repeat from * - *. Rib: *K 1, P 1 *. Repeat from * - *. 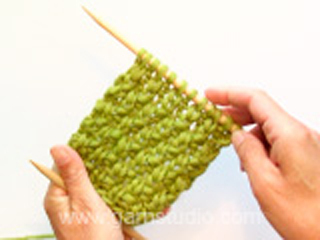 Cast on 164-176-194 (206-218-226) sts on smaller circular needles; join and place a marker at the join. Knit 4 rows Garter Stitch, 4 cm [1.5"] rib, 2 rows Garter Stitch. Change to larger circular needles and knit 1 row stockinette stitch, increasing 16-18-15 (17-23-23) sts evenly distributed over the center 80-84-92 (92-104-108) sts of the front and the center 80-84-92 (92-104-108) of the back = 196-212-224 (240-264-272) sts. Repeat from * - * across the body. 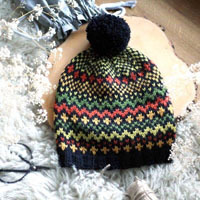 Knit the pattern as established. When the work measures 29-31-34 (35-36-38) cm [11-3/8» - 12.25» - 13-3/8» (13.75» - 14-1/8» - 14-7/8")], knit the next row as follows: Bind off 2 sts for the armhole, knit 94-102-108 (116-128-132) sts for the front, bind off 4 sts for the armhole, knit 94-102-108 (116-128-132) sts for the back, bind off 2 sts for the armhole. Knit front and back separately from this point. 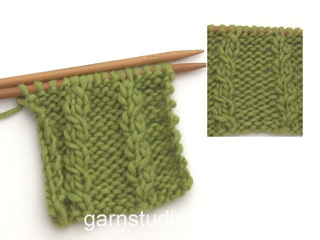 Bind off for armholes on every other row: 3 sts 1-1-1 (2-2-2) times, 2 sts 1-2-2 (2-2-2) times, 1 st 2-2-1 (2-2-2) times. 80-84-92 (92-104-108) sts remain. When the work measures 38-41-46 (48-50-53) cm [14-7/8" - 16-1/8» - 18-1/8» (18-7/8» - 19.75" - 20-7/8»)], bind off the center 34-34-36 (36-38-38) sts for the neck. Bind off at each neck edge on every other row: 2 sts 2 times, 1 st 1 time. Bind off when the work measures 40-43-48 (50-52-55) cm [15.75» - 16-7/8» - 18-7/8» (19.75" - 20.5» - 21-5/8»)]. At the same time, on the next to last row, dec 3-3-3 (3-3-6) sts evenly distributed on the row. 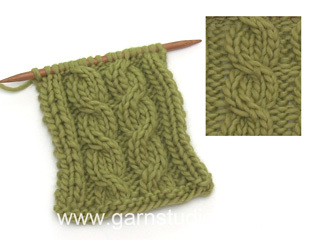 Bind off for armholes as on the front. 80-84-92 (92-104-108) sts remain. Bind off when the work measures 40-43-48 (50-52-55) cm [15.75» - 16-7/8» - 18-7/8» (19.75" - 20.5» - 21-5/8»)]. At the same time, on the next to the last row, decrease 16-16-16 (16-23-23) sts evenly distributed across the row. Size 3/4 years: every 4th row. Sizes 5/6 + 7/8 + 9/10 years: alternately every 4th and 5th row. Size 11/12 + 13/14 years: every 5th row. The increased sts are knit into Pattern 2 as you go along. When the work measures 26-30-33 (36-40-43) cm [10.25» - 11.75» - 13» (14-1/8» - 15.75» - 16-7/8»)], bind off 2 sts on each side of the marker and knit the rest back and forth on the needles. Bind off for sleeve caps on each side on every other row: 4 sts 5-5-6 (7-7-7) times and then bind off 1 -3 -3 (1 -3-5) sts 1 time. 28 sts remain. 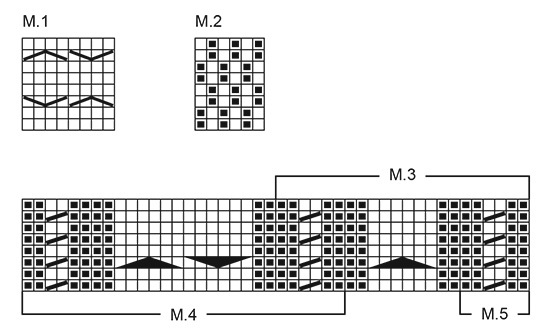 Continue knitting with Pattern 4 until Pattern 4 measures 7-8-9.5 (9.5-10.5-11.5) cm [2.75» - 3-1/8» - 3.75» (3.75» - 4-1/8» - 4.5»)] from the start of the top of the sleeve. Bind off on the right side of Pattern 4 on every other row: 14 sts 1 time, 2 sts 2 times and after that on every 4th row: 1 sts 1 time. 9 sts remain. 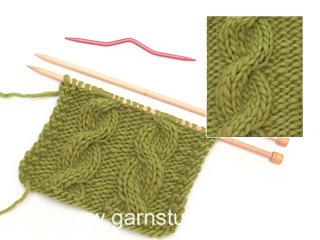 Continue knitting on these 9 sts until Pattern 4 measures 15-16-18 (18-19.5-20.5) cm [5-7/8» - 6.25» - 7" (7" - 7-5/8» - 8-1/8»)] (this is a strip that goes across the back). Put the 9 sts on a holder. The work should measure approximately 46-51-56 (61-66.5-70.5) cm [18-1/8» - 20" - 22» (24» - 26-1/8» - 27.75»)]. Knit like the right, but reverse all shaping. Sew on sleeves. Sew shoulder sts from the body to the shoulder strap. Sew the sts from the holder on both sleeves together at the center back. 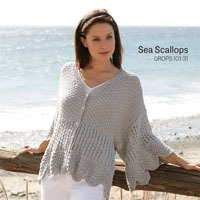 Pick up approximately 86-106 sts around the neck on smaller double pointed needles; join and knit as follows: 4 rows Garter Stitch, 7-7-7 (8-8-8) cm [2.75» - 2.75» - 2.75» (3-1/8» - 3-1/8» - 3-1/8»)] rib, 2 rows Garter Stitch. Bind off loosely. Sorry, das erklärt leider nicht meine Frage, es geht um die Abnahmen an Vorder-und Rückenteil. Liebe Sabine, sorry; Meinen Sie di 16 Abnahmen am Ende vom Rückenteil? Um die richtige Breite zu behalten muss man hier 16 M Abnahmen regelmäßig bei der letzten Rückreihe stricken, dh Sie stricken 92 M und nehmen Sie 16 M über die Zöpfe ab, 76 M sind jetzt übrig, bei der letzten Reihen ketten Sie alle Maschen ab. 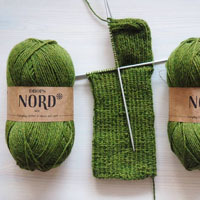 Viel Spaß beim stricken! Ein wunderschönes Modell stricke ich da gerade. Mir ist allerdings unklar wo ich am Rückenteil für gr 9-10 Jahre die 16 Maschen abnehmen soll. Mittig für den Halsausschnitt oder beidseitig an den Schultern? Liebe Sabine, Es sind 206 M in dieser Größe dh 103 M für je Vorder- und Rückenteil, die 17 Zunahmen sollen über die mittleren 92 M gestrickt sein (= *5 M ohne Zunahme, die nächsten 92 M stricken und gleichzeitig 17 M zunehmen, 6 Maschen ohne Zunahme*, von *bis* wiederholen. hier wird es erklärt, wie man gleichmäßig verteilt zunimmt. Viel Spaß beim stricken! Does this pattern come in adult sizes? Dear Jana, thi particular pattern does not comes in adult sizes, however we have a very similar pattern for men, You can find it here. Happy Knitting! Please explain: knit 1 row stockinette stitch, increasing 16-18-15 (17-23-23) sts evenly distributed over the center 80-84-92 (92-104-108) sts of the front and the center 80-84-92 (92-104-108) of the back = 196-212-224 (240-264-272) sts. Hi Janice, Stockinette is knit from the right side. You are increasing just within the middle stitches on the front piece and within the middle stitches on the back piece - so you don't increase over the remaining stitches. Happy knitting! Bonjour Mme Lafrance, tout à fait, vous la retrouvez ici. Bon tricot! Bonjour Mme Lafrance, tricotez les 56 m ainsi: 14 m en suivant M.2, puis M.4 (= voir encadré soit 28 m) et 14 m en suivant M.2 = 14+28+14= 56 m. Bon tricot! 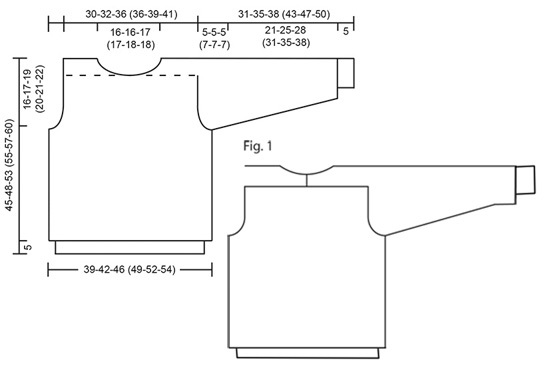 Dear Janice, in size 7/8 years you work: 10 sts of Pattern 2 = work diagram M.2 (= 6 sts) one time in width then work the first 4 sts in M.2 = 10 sts. See Pattern 3 in chart below where M.3 is framed = 22 sts. And Pattern 5 = as shown in M.5 = 6 sts. Happy knitting! Si può lavorare con i ferri normali e non circolari facendo il davanti il dietro e le maniche separatamente? Buonasera Giuliana. Sì può lavorare con i ferri normali e in parti separate. Per il davanti e il dietro è sufficiente che avvii la metà delle maglie indicate e aggiunga 1 maglia vivagno da ciascun lato per la cucitura. Buon lavoro! HOLA, QUIERO HACER EL SUETER LITTLE SAILOR CON LANA KARISMA TAL Y COMO INDICA, PERO DICE AGUJAS 2.5-3.5 CUANDO KARISMA ES DE AGUJA 4MM. ES UN ERROR?? . GRACIAS. Hola Marina, no, no se trata de un error. La lana Karisma no se trabaja exclusivamente con agujas de 4mm (aunque sean las más recomendadas); el número puede variar dependiendo de las necesidades del patrón.